Our shop and cafe are 2 miles west of Tisbury on the road between Newtown & Semley. Follow brown tourist signs to Pythouse Walled Garden & Cafe from Semley turning off A350. 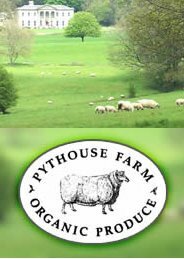 We stock our own organic beef, lamb & chicken, our own vegetables, fruit & plants and a wide range of other local products. Our potting shed cafe overlooking our beautiful walled garden serves breakfast, morning coffee, lunch and afternon tea. We are open every day except Tuesday from 8.30am to 5.30pm. We do a local box scheme and you can buy online too.